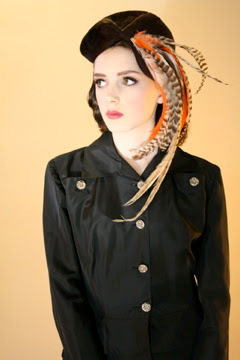 I adore the hat with the feathers! I wish people wore hats more often. Also, re your comment: I'd love to swap links. I'm linking you right now. Personally I can never see enough hats! I was just bidding on a fab vintage hat on ebay, with a huge pom pom, but my internet is misbehaving and totally crashed on me grr! I totally would wear that huge hat with the flowers it is quite insane! And I love the photos from this shoot - be proud and post them all! GOD i really want to go there, never had the chance. It looks amazing! Love those hats too, they must give you some kind of classy feeling right? the first hat is great and i really like your header! These pics are great! Love the hat. I just stumbles upon your blog, and I love it! Such beautiful photos and clothing...absolutely stunning! Great photos. I love them. You've got a really cool blog. So, these are the hats. Yea. I'm definetly NOT dissapointed. They are fabulous! Please wear them every day! They truly suit you. I adore them. So stylish!! These just scream Burberry meets John Galliano. So artsy and chic. Love it. What do you think about swapping links? wow these hats are gorgeous! 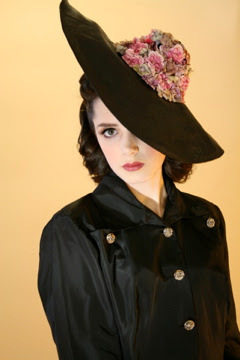 All these hats are gorgeous, they really "make" the look and the outfit. Like Amelia, I also hope people would wear hats more often, but I've got this bad feeling that it's never gonna happen again...vintage dreams. fabulous hats. i would love use them! It has a special charm. Sorry to comment again...I left a little award for you on my blog. I think your blog is just lovely! you are the most gorgeous 14 year old i've seen.